Economics affects our daily lives in both obvious ways and more subtle ways. From an individual perspective, economics frames many choices we have to make about work, leisure, consumption and how much to save. Our lives are also influenced by broader economic trends, such as inflation, interest rates and economic growth. Force we have little control over but can change our lives. Or we could spend 8 hours studying for our A – Levels. Each choice has an opportunity cost. 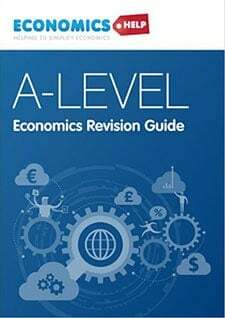 The opportunity cost of earning 8*£5.60 £44.80 is that we don’t have time to study. This could lead to poorer exam results, which could lead to lower future earning potential. Choosing to maximise our income in the short term (earning £45 a day) may reduce our lifetime earnings and could be a poor decision – unless working in a cafe doesn’t affect our future earnings. We may feel job experience more useful than an essay on allocative efficiency. The problem is that when making decisions about whether to study, work or pursue leisure, we may forget or ignore long-term effects. Deciding to spend all our free time earning £4.50 is something we may regret later in life. 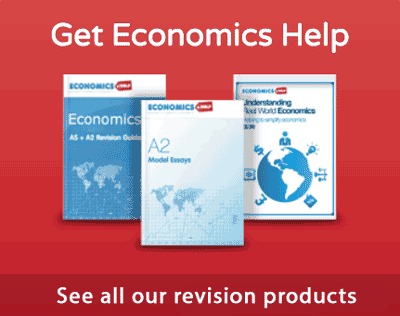 Economists suggest education is a merit good – meaning people may underestimate the benefits of studying. Under-consumption of education is an example of market failure. Considering opportunity cost can help us make better decisions. If we act on instinct, we may choose the most pleasurable or easiest course of action, but the best decision in the short term may not be best in long term. 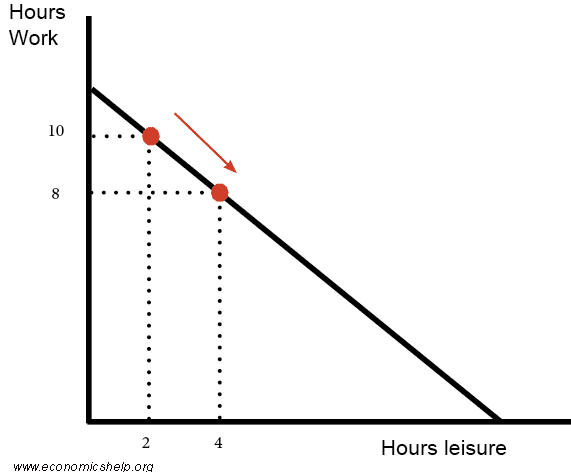 A production possibility frontier showing a simple trade off – time spent working or time spent on leisure. Another important element of life is work. Which job will give most satisfaction? It is not just about finding a well-paid job, we tend to gain most job satisfaction when we feel part of the process and a degree of responsibility and influence. Behavioural economists such as Dan Ariely have examined motivations for work and find that income/bonuses is less important than suggested by neo-liberal economic theory. In traditional economics, it is assumed individuals are rational and utility maximising. In other words, it is assumed we calculate decision to maximise our economic welfare – spending money only on those goods which give us satisfaction. However, behavioural economists note that we are often influenced by irrational and non-utility maximising influences. 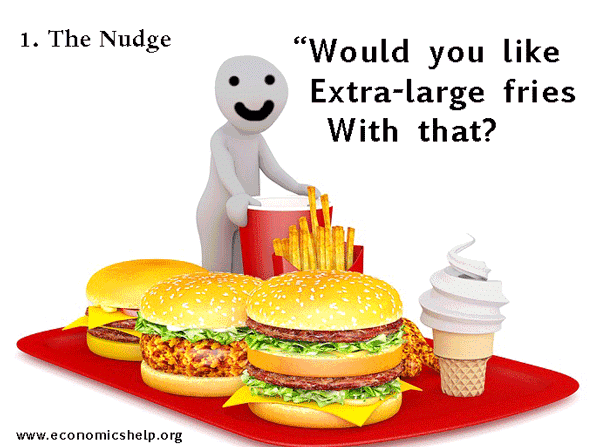 For example, companies which ‘nudge‘ us to make decisions which harm our welfare – e.g. super-sized portions, we don’t really need but cause us to become less healthy. The importance of the insights of behavioural economics is that we can become aware of factors which may cause us to make sub-optimal decisions. We can try to resist commercial nudges – which encourage us to consume goods which don’t really benefit us. 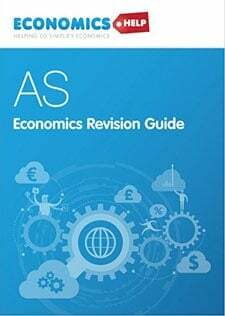 A recent development in economics is the work of behavioural economics – which places more emphasis on elements of psychology. For example, are humans really rational utility maximisers – as suggested by traditional economic theory? Behavioural economics suggests not – but humans are influenced by emotional factors, such as loss aversion (we prefer status quo, to losing what we have), present time period bias. When making decisions we don’t tend to first look at leading economic indicators. But, perceptions about the economic outlook can influence certain decisions. For example, those aware of the current economic situation may be aware the depth of the recession which makes a period of low-interest rates more likely. This suggests that if you could get a mortgage, mortgage payments would be cheaper, but, saving would give a poor return. However, the bad state of the economy and high unemployment rate is a factor that may encourage students to stay on and study. Since youth unemployment is currently very high, it makes more sense to spend three years getting a degree rather than going straight on to the job market. The only problem is that many other students are thinking the same. Hence the competition for university places is becoming much stronger. How to survive a period of inflation? Suppose, we are living in a period of high inflation, how would that affect our economic welfare? The real value of our savings will decline – unless we can secure an interest rate higher than the rate of inflation. In periods of high inflation, it may be advisable to take out index-linked savings – saving accounts and bonds which give an interest rate related to the inflation rate. How will we be affected by rising interest rates? If interest rates increase, then it will increase the cost of mortgage payments and interest on loans and credit cards. It can be problematic for individuals who are over-extended on credit. Higher interest rates can also lead to a slowing economy and increase the risk of unemployment. 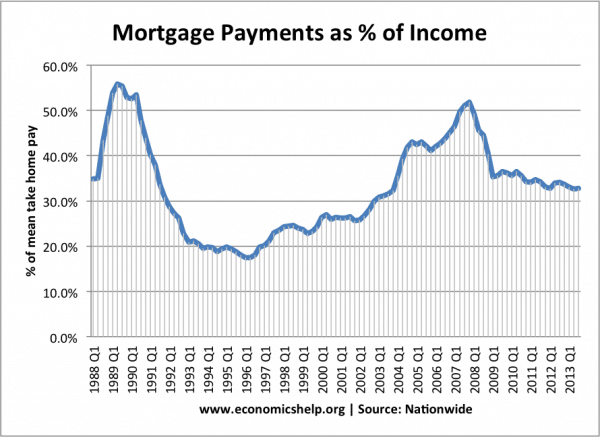 Mortgage affordability. High-interest rates in the late 1980s caused mortgage payments to take over 50% of take-home pay from households. See: effect of higher interest rates. 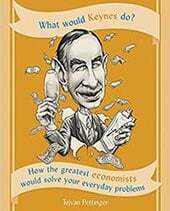 If we are considering investing in the stock market or housing market, what can economics teach us? One cautionary tale is that of irrational exuberance – avoid getting caught up in asset booms – where investor confidence gets carried away and people end up buying shares/assets – even though the price has become overvalued. Economics is important but sometimes I feel that people like us, accounts in the end fail in many other aspects of life because economics is always our main consideration. economics is the one important in our daily life.but some people can appreciate how important this.we need to cooperate all people in fair situation like reach even if poor. 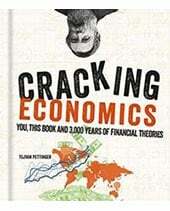 ECONOMICS IS IMPORTANT IN OUR DAILY LIVING BECAUSE IT MAKES USE OF SCIENTIFIC PROCEDURE OF FINDINGS. economic is important because its science as we as art…….. Thank you for this informative article on how economics affects our daily lives. I found the opportunity cost to be very interesting, like when you mentioned how we all make choices about what to do with our time and could spend either 8 hours working, 8 hours studying, or 8 hours doing something fun or relaxing. It’s tough to make economic choices on a daily basis but this article was a great beginning insight into how beginning economics work.